Does it look like Christmas? 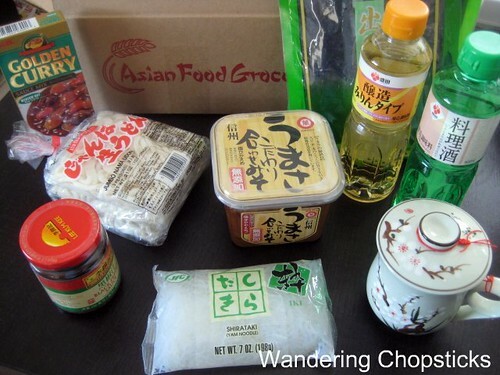 Actually, if you have trouble finding Asian grocery items where you live, I would recommend Asian Food Grocer. Most items were reasonably-priced, carefully packaged, and delivered within days at a reasonable cost. Anyway, so after receiving my box of goodies the other day, I was eager to test out the mirin. I've always been cheap and used either hsiao xing (Chinese rice wine) or regular white wine. I poured out a spoonful of each and found the green bottle of Ryorishu mirin to be quite strong, 13% alcohol. The yellow bottle of Jozo mirin was sweeter and had less alcohol, 8.5%. Very drinkable even. Normally, if I were to buy this myself at the grocery store, I'd just get one and try it out and maybe try another type or brand later. So it was quite nice to be able to get both and compare. Mirin is often used with fish dishes because the alcohol helps to reduce the fishy smell. 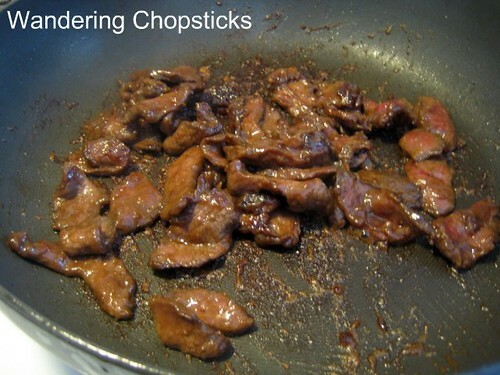 I decided to pair it with a small piece of venison I had saved in the freezer for stir-fries. Some people think venison is gamey but I've never had any problems. The trick is to rinse the meat after slicing to remove excess blood, which is where the gamey smell often comes from. Using mirin helps to further reduce any gameyness. Super quick and easy recipe. From the time I sliced the veggies to plating was less than half an hour. Just remember to start marinating the meat first so it has more time to soak in the flavor. Slice meat into strips about 1/2-inch by 2-inches. Rinse. In a bowl, add 1 tblsp mirin, 1 tblsp kecap manis, 1 tblsp flour, 1 tsp ground black pepper, and 1/2 tsp salt. Mix thoroughly and set aside. 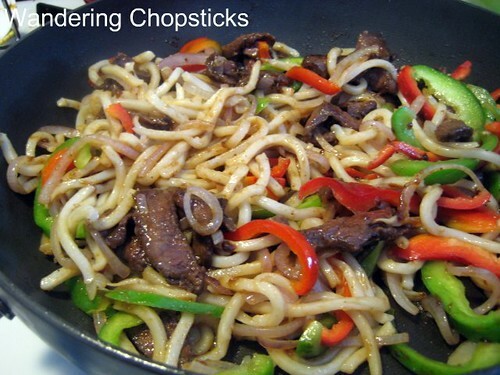 Slice onion and bell pepper into strips. Set aside. Now get all your ingredients together to start cooking. 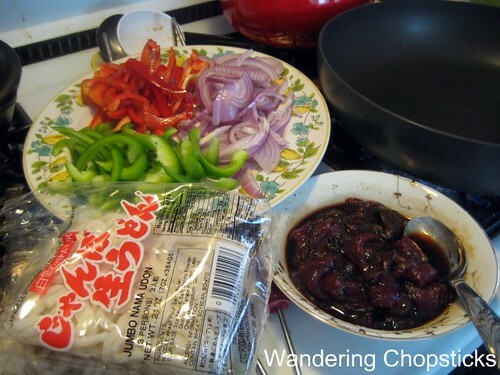 In a frying pan on high heat, drizzle sesame oil and add the sliced onions. 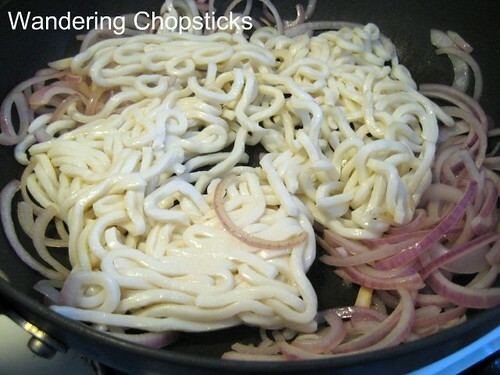 When the onions have softened and started to turn golden, add two packets of udon noodles. The noodles will be a little clumpy, but the heat from the pan will soon soften them. If you're using dried noodles, you'll have to boil those and drain them first. See? Softened udon noodles. Let the udon noodles brown, stirring every once in a while to get the noodles evenly cooked. Add in the bell peppers and when they have softened to your liking, pour the entire contents of the pan out into the plate that the veggies had been on. Then drizzle a little more oil and add the venison or beef, sans liquid, into the pan. When the meat has a nice char, add the rest of the marinade into the pan and let it thicken a bit. It's OK if the bottom of the pan gets a little sticky, just scrap it up with a wooden spoon. 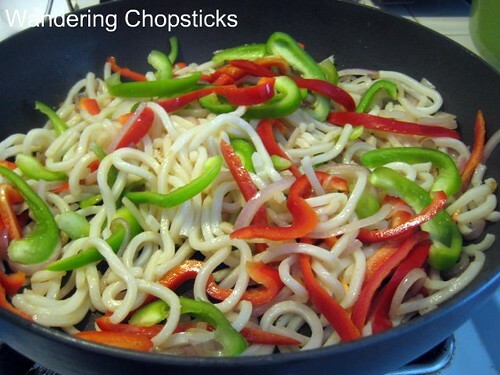 Add the veggies and noodles back into the pan and toss to make sure the sauce is evenly distributed. 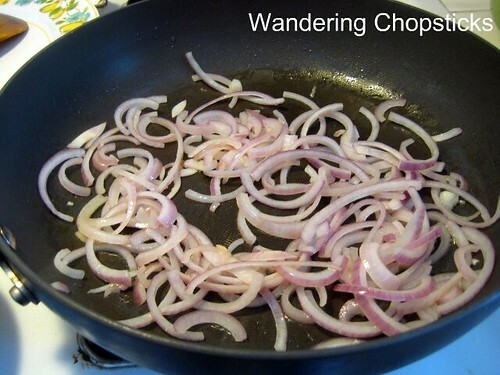 The order of the steps is important because this way the onions are allowed to slightly caramelize, the noodles get that pan-fried slippery-crispness, and the meat creates a gravy without bogging everything else down. This was the last day of voting for the Foodbuzz Blog Awards. Thank you to everyone who voted for me! I'll keep my fingers crossed. Also, today marks 2 million hits since I started keeping track on January 25, 2007. Wow. Who knew this blog would grow so much? 1 year ago today, Tuong Ot Toi (Vietnamese Chili Garlic Sauce). 2 years ago today, old photos of the dragonfruit flowers from when my family first started growing this cactus fruit. 3 years ago today, my fuschia cosmos were on their last legs. Also, strawberry guava and Iceberg roses. 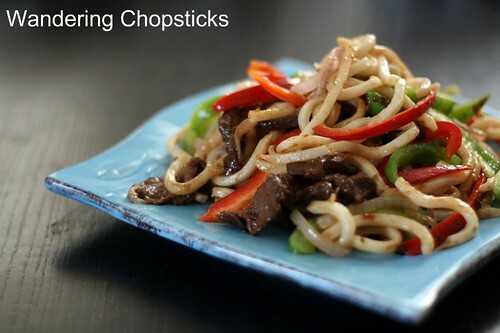 Your noodles look fantastic! And I appreciate the hints about ingredient order. That noodle crispness you mention is what I love the most. I'll have to think of veg substitution, but the recipe sounds great. I always forget to use noodles in a stir-fry. I always use rice. I still have peppers growing in the garden and udon in the fridge. I think I know what's for lunch. Why is it the Japanese have the most delicious ingredients on an individual level that when put together sometimes create that perfect umami taste or as we Quebecers like to say, "a je ne sais pas" taste. p.s congrats on the $30 credit! My biggest problem is that my stove just doesn't get hot enough so I need to compensate to get the proper char on food. As you can see, the noodles will soften on their own in the pan. 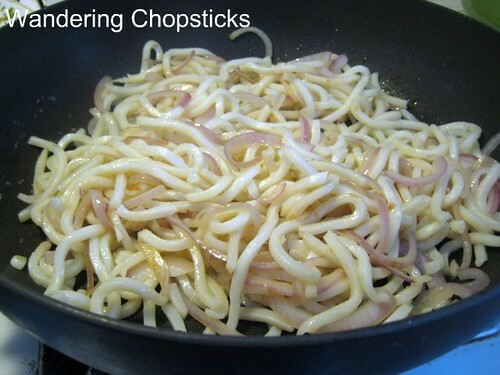 No need to boil fresh noodles when they'll be pan-fried or they won't be as crispy. I'm the opposite. :) I stir-fry noodles much more frequently than I do rice. You can easily make this with beef. Same thing to me. With everything available in your cupboard, then it's easy enough for you to make this dish. Kecap manis is Indonesian though. I'll have to experiment with miso paste more. I've never thought of using it in stir-fries. The credit was really nice to try out some new products. thank you for the recipe, i tried it with tofu and it was absolutely delicious (: great blog! Thanks for trying my recipe! Glad you liked it. Thanks so much for trying my recipe. So glad you liked it. I'm actually trying to decide between these two mirins right now! Which one would you recommend for all-around, all-purpose cooking? Which do you think is closer to "authentic mirin," or at least closer to the mirin that recipes call for? Thanks so much! I liked the yellow bottle, Jozo mirin, for its sweetness and find myself cooking with it more. I guess it depends on your sweet tooth? But the green one because it's less sweet and has a higher alcohol content, I find can easily be replaced with my hsiao xing rice wine or regular cooking wine. So it's up to you what you're trying to go for. I have no idea which mirin other recipes call for, since I'm just winging it when I use it. Thanks! I've been using honteri up to this point, so I don't think anything will taste quite as sweet as that! I really just want to get away from the corn syrup. I just Googled it and I think I know what honteri is. It's that thicker, sweeter rice wine? The Jozo mirin definitely doesn't taste as sweet, nor is it as thick as that. I rarely add sugar to my savory dishes, or just a light pinch, so the sweeter mirin is good for me to add a little sweetness to my cooking without too much. But honestly, sometimes I forget and just reach for whichever is handy and don't notice much difference. Sounds delicious! I have most of the ingredients at home with the exception of the fresh udon noodles. I have dried ones though - would those work in this dish or do they have to be fresh? Sure, just boil the noodles, drain, and prepare them as per the recipe. 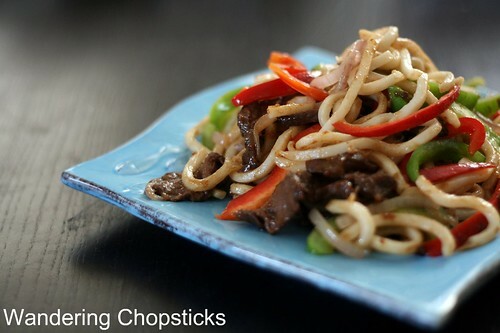 I know this is a little late, but I was looking for a yaki udon recipe and your site came up when I googled it. The green bottle that you have is cooking sake, and the yellow bottle is mirin. Mirin is sweeter. Both bottles are a necessity in my kitchen. Japanese food uses them all the time. Thanks for the recipe! It's never to late to get cooking tips or clarifications. Thanks for explaining the differences. I use both depending on what I feel like cooking that day.